Me being right all the time can be tiring – for everyone. 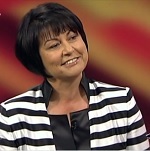 Hekia Parata today warned that Schools where children were failing exams could be taken over by the Government. She also warned that staff need to be held accountable for students’ performance. Ms Parata said that although the option to intervene because of educational performance was already there, better data and information meant it was now easier to make a call to do so. There were 70 schools under the control of statutory managers or commissioners at the start of this month. One of the most effective National government policies on education in recent times has been to put a gag on Hekia Parata. However today’s announcement shows that she has managed to give her minders the slip and return to her unique brand of rhetoric that never fails to piss-off large sections of the electorate. Despite the obvious absurdity of the government threatening to take over schools it already owns and runs at least they are consistent being already in phase two of selling the public assets they already own. However in fairness to Hekia she may have hit upon a winning formula here and ushered in a new era of public service accountability. If the teachers and principals are to be held to account for the performance of their students then it is only fair that this standard be applied to that other group of public servants – politicians. If they preside over daft decisions and our country starts slipping in the key ‘national standards’ then surely they should be held to account or face being stood down while someone more capable is put in charge. This logic starts to come a little unstuck when we start examining our ‘someone more capable’stocks but we shouldn’t let that stop us trying.